In 2003 Skype was developed. It was the social network allowing people to communicate and see each other due to webcam! It really broke through. Even such famous social networks like Twitter, Facebook and that kind of thing was developed later and since then we began texting every day via SMS or messengers, send voice messages, electronic mails, communicate via social networks. And give Skype and video chatting, in general, a time to take a pause because of a low-quality image. Since nearly, it is all about video chats. Can you imagine ten years ago that we will make selfies through front-facing camera not using a photo camera and use monopods? Or that we will talk face-to-face with a person who is far-far away, using smartphones? I suppose, no. But now we can do it. Smartphones have completely changed the way we communicate with each other. Now it is possible to take a smartphone and keep in touch with our friends, family and love wherever and whenever you want to. If you is not an Apple user and do not have a FaceTime, which we will talk about a little bit later, I think, this post will please you. By the way, if you have some problems with FaceTime using, check the post Facetime not working; How to fix it . There we explained what problems are and how to fix it. And now editor recommend you to visit some outstanding posts ! Check 13 Great free calling apps. It is not surprisingly that we start our top-list with this messenger. Firstly, you have already launched it (or maybe there are other ways to chat in Facebook? 🙂 and most of the friends you communicate with too. Secondly,it is very easy-to-use and has an up-to-date interface design as outside as inside. All you need is to open up the app, press on the person’s icon you want to call and tap the camera button in the top-right corner. You will be immediately connected to your friend and be able to talk as long as you want for free. Just make sure that your device is connected to the internet or wi-fi. Moreover, there is a free chat, and photos, videos, and voice calls exchanging. Also, you can create a group of people whom you text a lot every day. 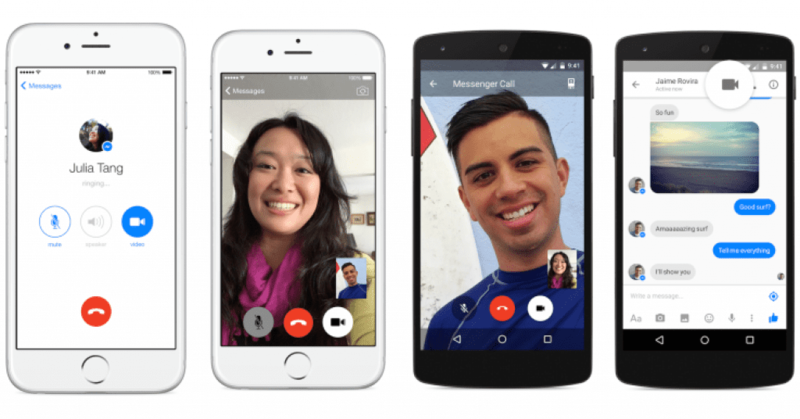 It is a completely new video chat and messaging platform created by Google developers. 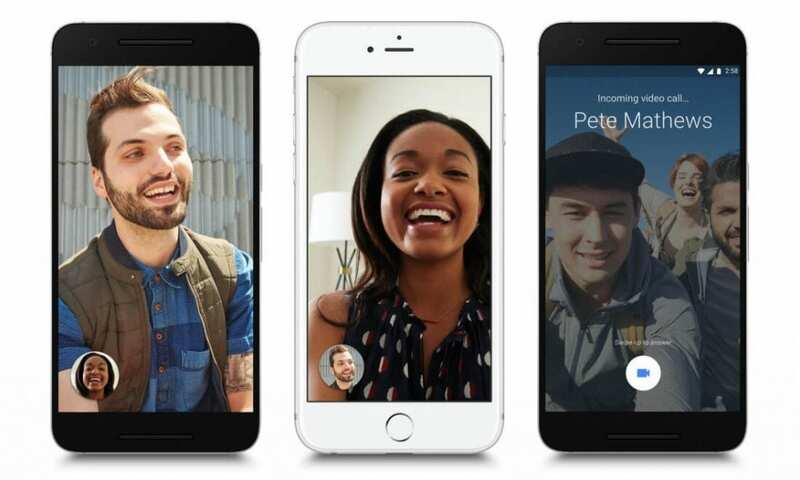 To say the truth, it replaces three well-known products by Google production : Google Talk, Google + and Hangouts, the messenger and video chat platform allowing people to keep up with each other , using front-face cam. Like Siri open Facetime by the request, Hangouts is provided with supporting of “Google Voice” technology. It makes Hangouts friendly-to- use and up-to-date. 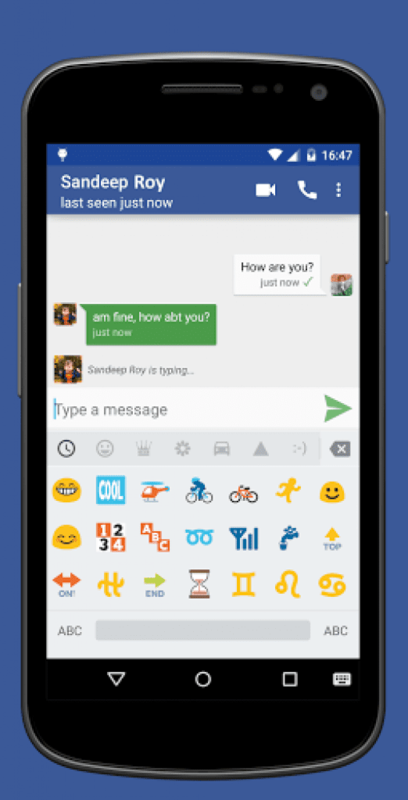 If we talk about Android devices, current versions use Hangouts as the default application for texting. 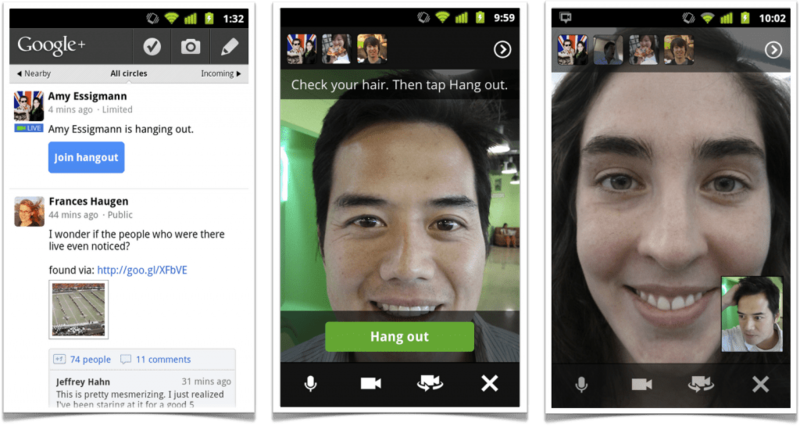 We appreciate Hangouts for an ability to log in via Google+ and do free group video calls up to 10 other people. Notice, that video calls are available if your devices over 3G/4G or connected to Wi-fi or the internet. 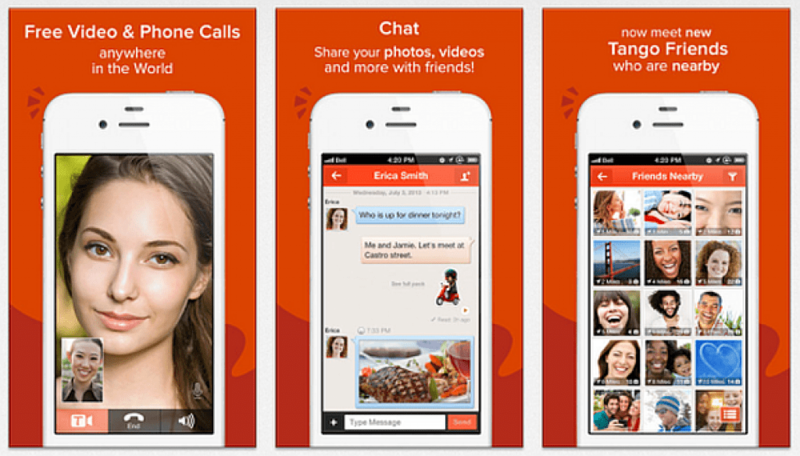 Tango is one of the best apps for video calls face-to-face. It wins the third place at our list due to high-quality of video calls to other users. It doesn’t matter, whether your friend owns an Android, iOS or Windows device. Tango is supported on every platform. Secondly, Tango doesn’t require an authorization and any password. For me, a messenger ,having no password, is a real find. And what is more important, it is pretty simple to use. As a bonus, you can play games, send music messages via Spotify while conversation. 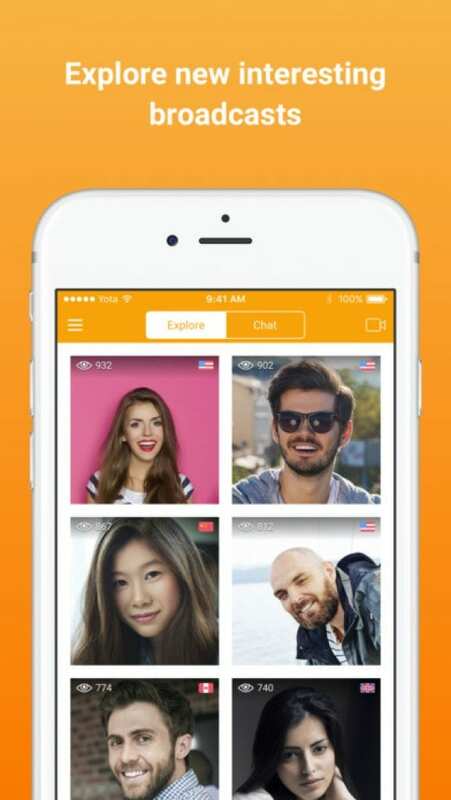 It is Also one of the best apps for video chatting ,as well, and in AppStore and Google Play ,in general. Viber unites people all over the world, providing them with an opportunity to make calls and video calls with HD Sound, send voice messages, photos videos, GIFs and animated icons. Sounds cool, isn’t it? Moreover, you can play by two Viber characters and earn coins while calling. Apart from, there is an option to send your current location so every person you are talking with sees where are you. I have a lot of friends and it is important to me to create a big group chat. In this question, this app is fully satisfying me by having up to 200 persons in a group chat. In fact, users made calls only to Viber users, so if you are going to make a video call , make sure that your friend is the user of Viber. Speaking about LINE, I exactly know that this app won’t let me down. And 600 million of users worldwide agree with me. It is supported on every platform, whether it is Android, iOs or Windows or BlackBerry. You know, how difficult sometimes to talk with a lovely friend or a member of your family face-to- face, especially , if you are about 1000 km away from home. That is why video calls, making the world a small place, are the right decision. On LINE crystal clear video calls will be supported by the availability of 3G, 4G, Wi-fi or internet connection. The interesting feature of the Line is that you can add friends in various ways, such as shake it together to add the friend or exchange your ID via QR code. Moreover, for texting, you will find a great library of stickers, GIFs, and other cool things. 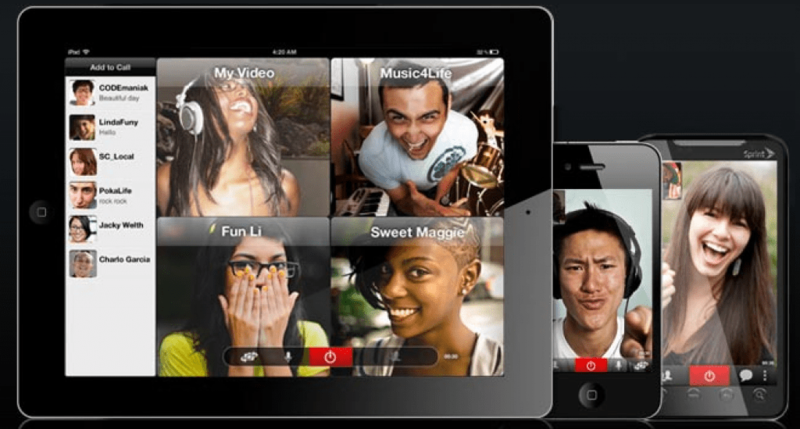 It is a cross- platform for video chatting online. It a little bit akin to Snapchat or Periscope, but in the reality, it doesn’t . 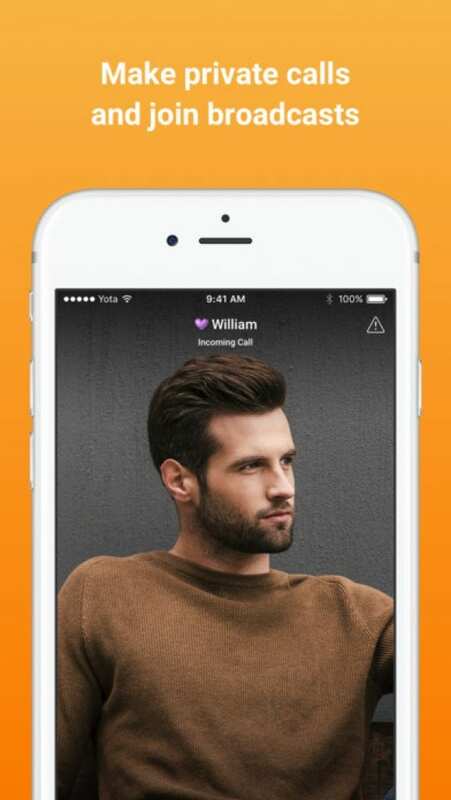 Using this app you won’t be able to call your friend, you will chat with every people in the world who is watching you nearby or in different distant corners of the world. Apart from public video chatting, private conversations are also available. 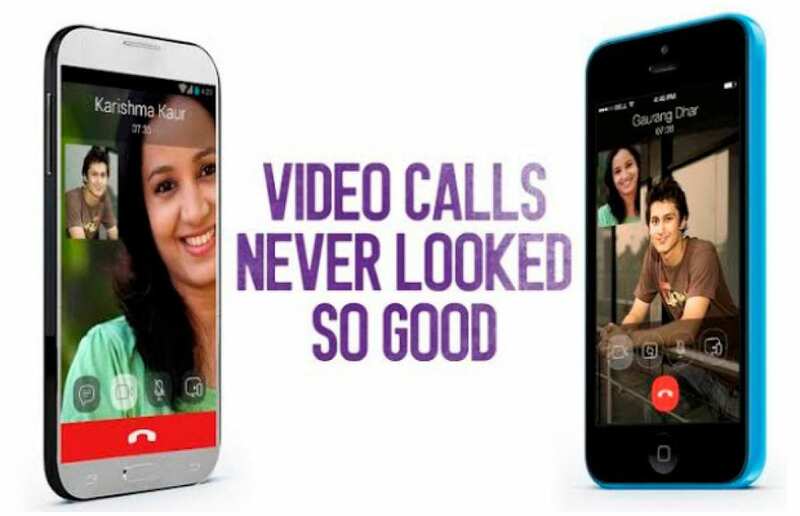 Speaking about all features, you will be provided with a high- quality video calls and sound. Enjoy live video communication over 3G, 4G, LTE and Wi-Fi for free. We select only checked apps with a high rate, so you can be sure that all apps in this list are efficient, friendly-yo-use and really enjoyable. Speaking about ooVoo, I can say that it is one of my favorite apps in a question of video chatting. My friends don’t have an ability to call me in FaceTime, so I downloaded this one and it took my heart. At first, it is possible to call face-to-face or to create a group chat, including up to 12 people. Secondly, ooVoo uses SuperClear™ – their patented technology automatically detects and adjusts to your connection speed, which means fewer dropped calls. 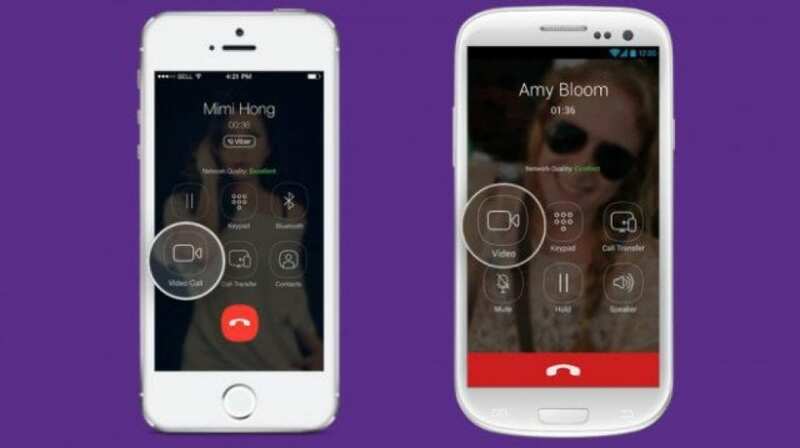 Moreover, it provides you easy calling by one tap to the icon with a camera and a high-quality video and voice calls. 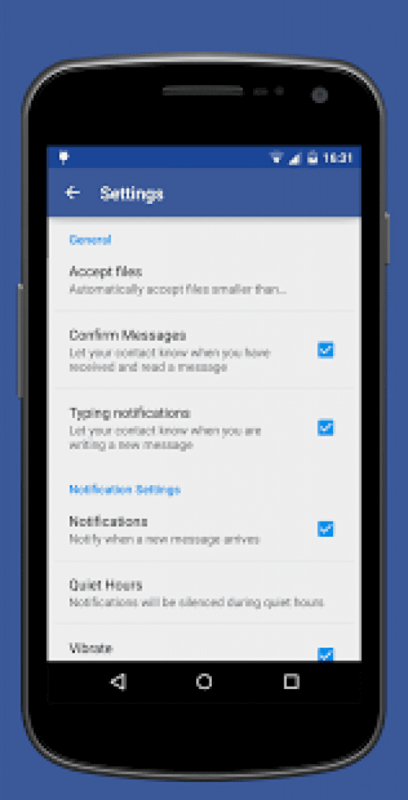 Apart from, you can use it as a messenger with ordinary functions. 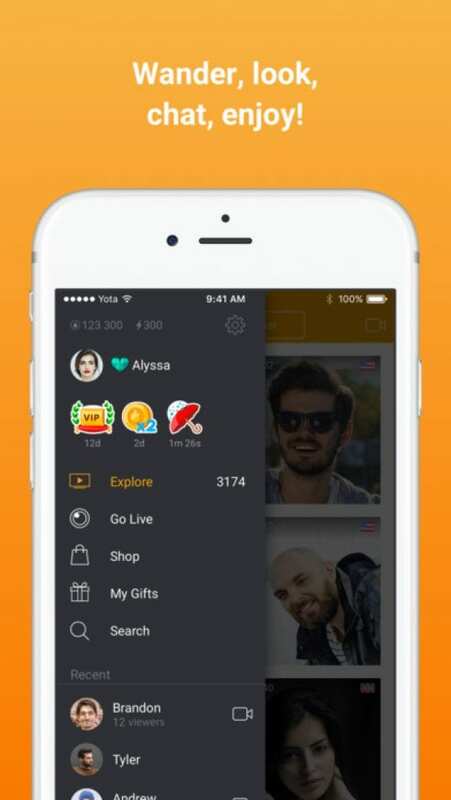 Add stickers, share photos and videos with your friends. The oldest video chatting platform on the whole internet. Let’s remember, what we appreciate in Skype after its updating. 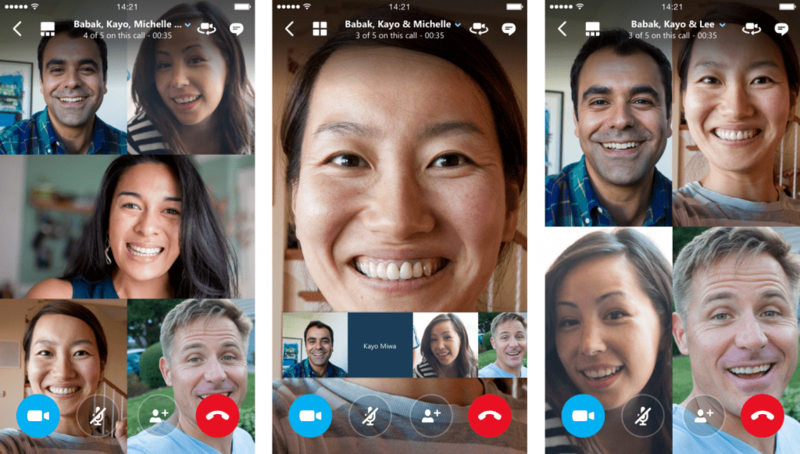 We love video calling face-to-face or creating a group chat up to 25 persons. We enjoy free voice calling and texting a lot. We appreciate calling mobiles and landlines at low. There are reviews from 700 million potentially users. It is worth something. Also, it doesn’t matter , whether you have an Apple , Android or Windows device, it is supported on every platform. Apart from, people use this app on every device, whether it is a tablet, computer or a TV, providing with a Wi-fi connection. Skype unites all hearts all over the world. 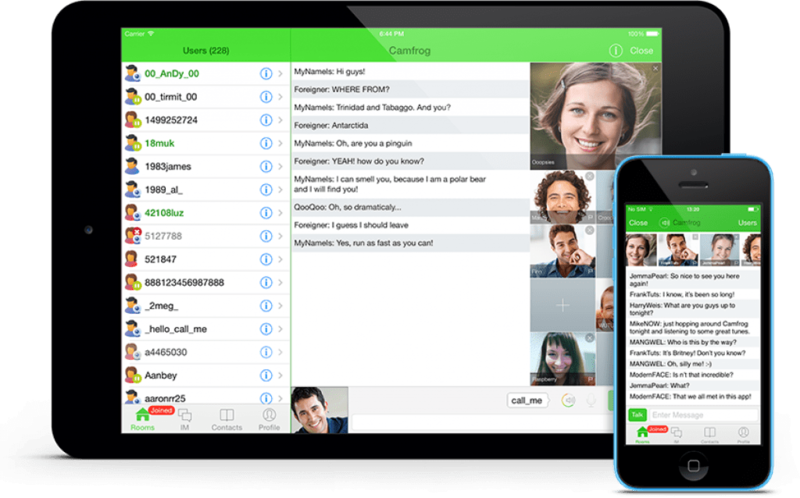 Moreover, make private calls to your friends using iPhone, iPad ,iMac or Macbook. How often you have to move in an other cities in searching for better job,better life or going to a college but your family stay in your native town. Of course, you miss them every time. 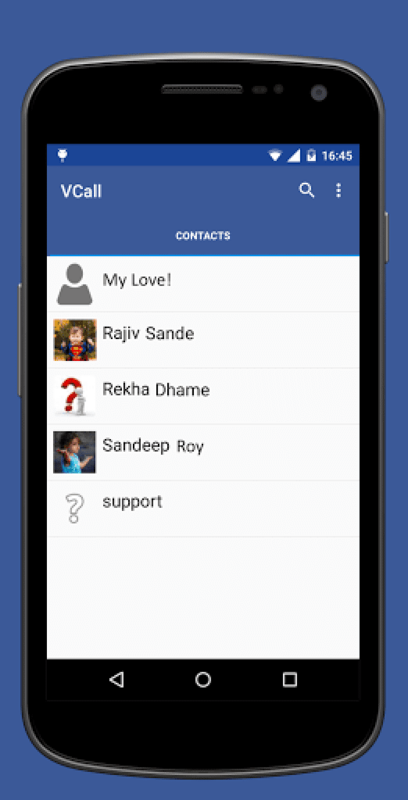 In this case, Video Calling free provides you an opportunity to keep in touch with people you love, If there is no built-in video calling free software you don’t worry this application can guide you to make video free call. Moreover, it is pretty simple to use because you sign in via Facebook and you don’t need to fill the gap to registrate. VCall also will automatically connect you with your phone and Facebook contacts, who already use VCall. So there is no need to add your friends manually. With VCall you don’t need to take care for missing important messages and calls with notifications you can push in the Settings. It will inform you even if you are offline. 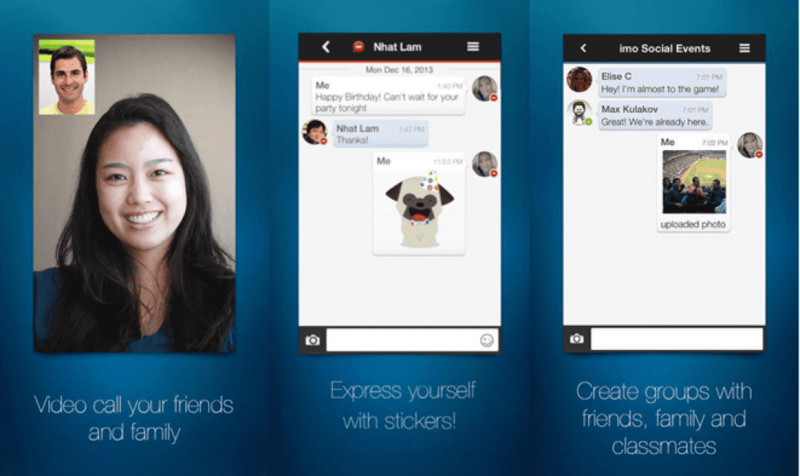 Another best app for chatting and video chatting developed by Google Inc. I have never met as much friendly-to-use app as Google Duo. At first, you will be given a choice of whom you can call. Simple one-tap calling and super smooth switching from cell to Wi-Fi make it easy to check in from anywhere. 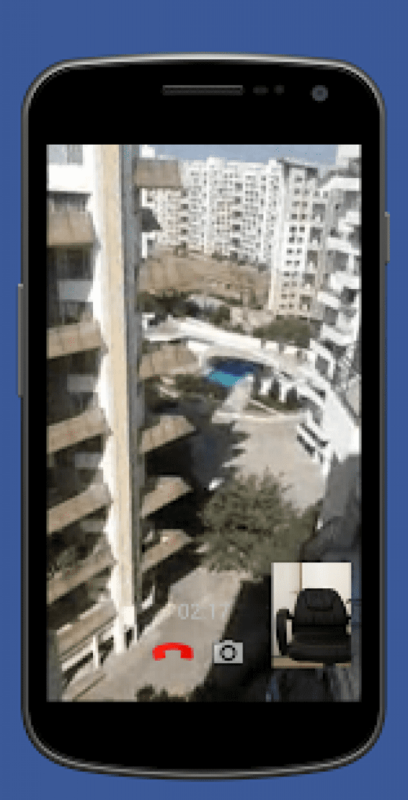 By the way, Google Duo is considered as one of the best apps with a high-quality calls and image. Interesting feature : you can see what’s up before answering. How it works? Preview incoming video calls from anyone with Knock Knock. You will never miss important moments like a meeting with your friend’s new-born child or your mom’s first fly on a plane. After updating, IMO turned into one of the top video calling applications. There you can keep in touch with your friends and family wherever and whenever you want to. Even if you want to see all your friends, make a group chat up to 10 people, and make FREE video and voice calls over your 2G, 3G, 4G or Wi-Fi connection. I think, you won’t lost in the interface. It is very simple-to-use. 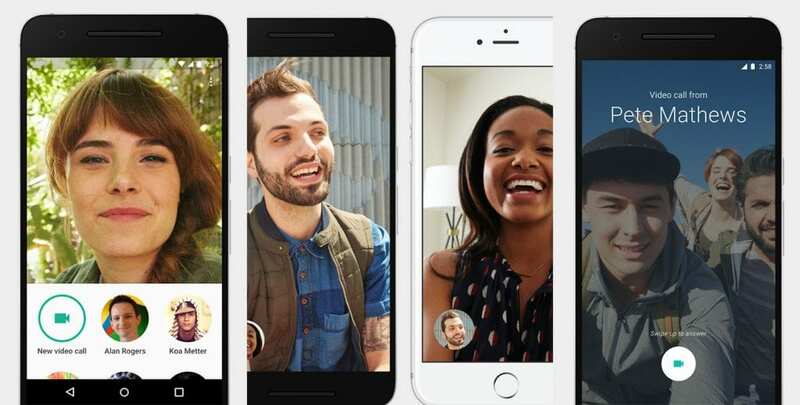 So, there were 13 Best video chat apps for your iPhones and Androids. All of them are supported on tablets ,so you can show how to use one of these apps to your grandmother and grandfather and keep in touch with them whenever and wherever.